As I announced earlier we had opened User Survey for Zeitgeist for general feedback and assessment of our own work. It was also to help us understand what are the user requirements. After 5 days, we have received 261 responses. Instead of going in details and boring you, I would like to keep the post as short as possible and provide detailed analysis in the next post. Our survey contained questions related to general Zeitgeist questions, Activity Journal, Activity Log Manager, Datasources and Community aspects. Users were also asked about their distro of choice and optional name, age and Country. The biggest share of responders were using Ubuntu – 136. 30 of them were using derivatives. 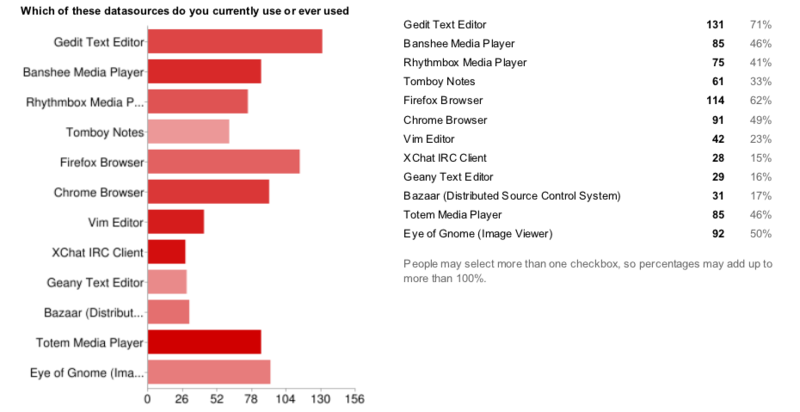 I am also happy to see Fedora and Gentoo in the list. Online blog/news-outlet and Planet make up a huge percent of users. It is evident that people do follow these two very closely. Notice that total does not add up to 100% as just hearing the name might not be sufficient for someone to figure out what it is. Pretty much obvious conclusion. The user know what it is but most of them are not geeky. Looks like those 6 “I hacked on the codebase” was selected by contributors. One half of my brain says “Teach them what it is” and the other side says “No. Not everyone is very interested in being force taught”. Guess what? I take the central stand and will publish a short article on what all components of Zeitgeist do. Which of these Datasources do you use? This is a VERY VERY important chart. This tells us the adoption of datasources esp when datasources are not present in Ubuntu, Debian, Fedora and openSUSE (AFAIK for last two). I think they are present in Gentoo and Arch. Which datasources would you like to see in the near future? I never thought Thunderbird would come out as first. My expectations were with Gnome-0shell which is actually second. Good news is that Thunderbird datasource is in progress. Mark Jtully is working on it. Gnome-shell would is also in progress. Since other were 76, I would like to name a few, though I would prefer a separate post for this. The number 76 has led me to make up my mind for a special treatment. Activity Log Manager is Administrative tool for Zeitgeist. You can temporarily stop logging, blacklisting certain applications from logging information, blacklisting certain mimetypes, clearing all history between time range etc. It is a handy tool. A new version is going to be out soon. It is really sad that half of the people never heard about it. Looks like we failed at spreading the word. By the way there has only been a single release. How much are you involved with the community? 40% of the people are users. “Nor am I interested” is not a harsh phrase. It simply means “I use so many applications and it is not possible for me to be involved in each and every community”. 15% of the respondents are eager to join the community. Probably you all can help us in testing. This is where most of the manpower is needed. In case you have problems, where do you ask your questions? Two-third of the people do prefer forums. Mailing lists and IRC still trump over Q&A sites. I think many people have answered this not only for problems but also for general questions. In case you are an Ubuntu user, you can ask your question on Ask Ubuntu and tag the question with zeitgeist tag. Are your problems related to Zeitgeist solved? Did I tell you that this chart has boosted my morale? 70% of the people didn’t have problems with Zeitgeist. I now really guess that these people were asking general questions or discussing about zeitgeist and replied to the above question. Whatever be the case, we still have 10% unsatisfied users from the samplespace. 10% is a significant number. Hope we can bring it down by the next survey. You need more datasources. In other words we need to provide more datasources which you need to install. It’s [Activity Journal] good, but shouldn’t we be providing this information through the UIs made available by the host OS? Please integrate it into Gnome Shell if it light enough. It would be nice if these datsource plugins are included by default without the user having to do it manually. This way it just works. A ppa would be nice.